According to data from Mexico’s Tourism Secretariat, the number of cruise ship passengers peaked in 2007, but has since declined, although their average spending has increased. 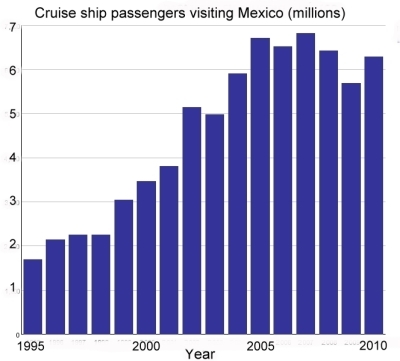 The graph shows the number of passengers arriving on cruise ships to Mexican ports since 1995. This segment of Mexico’s tourism industry grew rapidly between 1995 and 2005. The peak year was 2007 when 6.814 million cruise ship passengers visited Mexico. This was also the year when President Felipe Calderón announced the start of Mexico’s “war against drug cartels”. Since that date, more than 35,000 people have lost their lives in drug-related violence. The dramatic decline in cruise ship passengers between 2008 and 2009 can be largely attributed to the A-H1N1 flu epidemic, which is thought to have started in Mexico and which brought regional falls in tourist numbers. In 2010, cruise ship passenger arrivals showed signs of recovery, though they remained well below the numbers registered in the peak years from 2005 to 2007. In 2011, the provisional first-quarter figures suggest a slight decline from 2010 numbers. Security concerns are the main reason for the continued drop in cruise ship passengers visiting Mexico. Earlier this year, Princess Cruises, the major international cruise line, canceled all sailings to Puerto Vallarta and Mazatlán until at least the start of next year. Other cruise lines, including Holland America and Carnival, are also reported to be considering schedule cuts. The only silver lining in this dark cloud is that the average spending of cruise ship passengers has risen, helping to offset the decline in visitor numbers. It is estimated that cruise ship passengers will contribute about 104 million dollars to Mexico’s economy this year, compared to 112 million dollars in 2007. Even so, the average expenditure per passenger remains very low, certainly below $100 a visit. The average figure has risen over the past few years, but preliminary figures for the first quarter of 2011 reveal that it was still only $91.20 per cruise ship passenger. Resorts receiving cruise ships need to boost this tourist expenditure figure by offering a wider range of on-shore attractions and attracting higher spending from visitors in order to offset any decline in the number of cruise ship passengers visiting the country. In the long run, the cruise ship sector will only recover fully when drug-related violence is reduced and foreigners’ perceptions of the safety of traveling to Mexico improve. Is tourism in Mexico expanding? Chapter 19 of Geo-Mexico: the geography and dynamics of modern Mexico focuses on Mexican tourism and development. Buy your copy today to have a handy reference guide to all major aspects of Mexico’s geography! Have you got a source for your expenditure figures? I suspect that folks will confuse the number you quote (estimated by the industry itself?) with the amount spent (and retained) locally. That number is likely much lower than $91. More like $35-50 in our experience. Thanks. I don’t have the source in front of me, but am pretty sure it was the central bank (Banxico) in a quarterly report. I’ll take a quick look later and will post the precise URL if I can locate it. Certainly any figure for “average expenditure” covers a very wide range of tourist experiences. You don’t say which port(s) you are referring to, but (by way of example) would you agree that shore excursions for visitors arriving in Manzanillo or Mazatlán on the west coast are probably less expensive on average, than similar visits to Cancún or Cozumel on the Caribbean coast?